BEIJING, China (CNN) -- A photo of the Spanish men's Olympics basketball team, using their index fingers as if to slant their eyes, has sparked controversy with Asian rights groups. 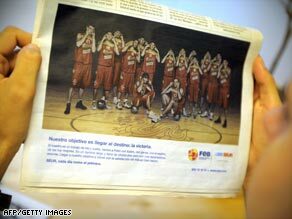 The photo, taken for a sponsor of the Spanish basketball team, shows the players making an eye gesture. The image, showing the players pushing up the outside corners of their eyes, was taken before the team left Spain for Beijing. News reports on the photo have stirred controversy, particularly outside China. Some have criticized the team for making a racist gesture, an assertion the team denies. A group that represents Asians in the United States described the photo as "disturbing" and "divisive." The photo has not been widely circulated in China. A few people in China have criticized the photo in blogs and online bulletin boards. One wrote "Shame on you!" while another said "Silly Spanish basketball team -- look at what they are doing." Others dismissed it as much ado about nothing. One argued that "they are just trying to be cute." One Spanish baketball player, Jose Manuel Calderon, said in a blog on his Web site -- www.josemanuelcalderon.com -- that the picture has been "interpreted incorrectly." Calderon is a native of Spain who also plays in the NBA for the Toronto Raptors. Calderon said a sponsor asked the team "to pose with a 'wink' to our participation in Beijing" and that "we made an Oriental expression with our eye." The photo reportedly appeared in an ad for a Spanish courier company that sponsors the Spanish Basketball Federation. "We thought it was something appropriate and that it would always be interpreted as somewhat loving," he wrote. "Nevertheless, some of the European media did not see it this way." Neither did George C. Wu, deputy director in Washington of OCA, a group that was formerly known as the Organization of Chinese Americans. It describes itself as a social-justice organization that advocates for Asian Pacific Americans in the United States. "It is unfortunate that this type of imagery would rear its head during something that is supposed to be a time of world unity," Wu said in a statement. "As Asian Pacific Americans support U.S. Olympic athletes, some of whom are Asian-American, it is disturbing to OCA that Spain's basketball team would introduce such divisive imagery into the Olympics," he said. Two members of the Spanish Olympic team who play in the NBA -- Calderon and Pau Gasol of the Los Angeles Lakers -- may hear from Asian fans after the Olympics, Wu said. "If they haven't realized their mistake yet, they probably will hear about it when the NBA season comes back around," he said. The controversy unfolds at a delicate time for Spain: Madrid is among the finalist to host the 2016 Summer Olympic Games, and Spanish athletes and fans have been criticized and sanctioned for actions deemed racially insensitive. And in February racing fans in Barcelona blackened their faces and taunted Lewis Hamilton, Formula One's first black driver. Yet Jose Luis Saez, president of the Spanish Basketball Federation, told CNN on Thursday that people are wrong to suggest the photograph has racist overtones. "It's simply ridiculous," he said. "It was a gesture of affection ... and identification with the Chinese people." He pointed to a Wednesday article in El Pais, a Spanish newspaper, that quoted a Chinese Embassy spokesman in Spain as saying "we don't interpret this gesture as offensive" or racist. "Ultimately there is a very good relationship between the Chinese and Spanish governments and there is no kind of conflict at all between the two peoples," El Pais quoted the spokesman as saying. Calderon sought to to quell any controversy. "From here I would like to declare that we have a huge respect for the East and their people," Calderon wrote in his blog. "Anyone who would like to interpret this differently is absolutely confused." CNN's Yuli Yang and Jaime Florcuz contributed to this report from Beijing. CNN's Mark Bixler contributed from Atlanta, Georgia.